My favorite memory is when I went to a new school for 4th grade. I was really excited about my teacher and meeting new people. 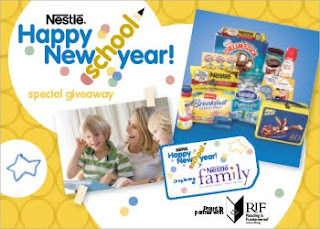 Nestlé knows that this season is a hectic one for families and they want to help you celebrate the new school year with a giveaway designed to get your family started off right. Prize includes a $25 gift card to Walmart to help with school supplies, plus great Nestlé goodies like a NESQUIK® lunch box, product from RAISINETS® and a mix of free coupons from NESTLÉ® Pure Life, OVALTINE®, TOLL HOUSE® Refrigerated Cookie Dough, TOLL HOUSE Morsels, NESQUIK, COFFEE-MATE®, DRUMSTICKS® and CARNATION® BREAKFAST ESSENTIALS™. Don't forget to enter Nestle's Happy New School Year Sweepstakes to enter for a chance to win a grand prize of $5,000 worth of back-to-school essentials plus a $2,000 NESTLÉ Literacy Grant for your school, as well as daily prizes from Crayola. Disclosure: I received package similar to the prize in exchange for hosting this giveaway. To enter, please comment on this post with your favorite back to school memory. Entries will be accepted through October 6th and I'll pick the winner using Random.org. US readers are eligible. I remember having fun doing all the back to school shopping when I was a kid. I was excited to wear my new school clothes. My favorite back to school memory is hanging out with friends before, during, and after the school day :) *Thanks* for the giveaway! My favorite memory is shopping for school clothes. I loved being involved with choir & theater. The arts in schools are so important! I receive updates via email too! And now I am a Facebook fan! I remember getting a new thermos when I started first grade and it made me SO HAPPY! I always liked going back to school and catching up with people that I had not seen all summer. My favorite memory of school was the day I saw some kids being really mean to this little girl and I walked up to them and said leave her alone! I found my best friend that day. Definitely going back to school shopping with my mom! My favorite back to school memory is from Junior High (during the late 1980's) - I was finally able to get a pair of Jordache jeans! My favorite back to school memory is getting a new Shirt Tales Trapper Keeper and thinking I was so rad. My favorite back to school memory is going school supplies schopping with my mom, we always made a whole day out of it and went to get our nails done and had lunch. It was really fun! my favorite BTS memory was getting to pick out school supplies and buying school clothes! My favorite back to school memory occured every year. I was excited to get a new lunchbox, school bag if needed, and a new box of crayons. My favorite back to school memory involves my daughter and me walking to school her first day of kindergarten. She was so nervous and I remember her saying how she wanted to just stay home forever. After a few tears she was in the play yard. And that afternoon when I picked her up she was so excited because she had made so many new friends and could not wait until tomorrow. I knew then that it was not me more sad than her. I loved getting all new supplies for school! I still love papers and pens! I used to love to organize my new pens and pencils and stuff! So much fun. My favorite back to school memory is shopping, and choosing my outfit for the first day! My mom taking me out for breakfast for the first day of school. My favorite memory was getting all dressed up the first day. My favorite back to school memory was starting a new school and meeting a ton a friends right away! I loved school so much that I became a teacher! It's hard to pin down a favorite school memory considering all the years I was a student and then a teacher. I was always so excited as school was starting - getting new school supplies, a new lunchbox, and meeting my new teacher - and later meeting my new students! I remember shopping for new navy loafers in the 9th grade. My favorite back to school memory is shopping for school supplies with my mom. My favorite back to school memory was a tradition my Mom started for me back when I was in 2nd grade. We went school shopping for paper, notebooks, etc, and i got to pick out 2 new outfits - then the best part- she would go pick up one of my girlfriends and we got to go to this little diner for lunch. We did this at the same diner up through my 2nd year in college! :) Im tearing up now....:) Great memories! my favorite back to school memory would have to be the bud billiken parade.